This home is located in a gated, family oriented oceanfront resort community with 24 hour security. This wonderful location has two pools (indoor and Olympic-size outside) plus two kiddie pools, three playgrounds, snack bars, grocery store, bingo and other planned activities for the entire family at the recreation center. Only minutes away are major attractions such as Broadway At The Beach which includes Hard Rock Cafe, Planet Hollywood, NASCAR Cafe, Ripley's Aquarium, IMAX Theater and the Palace Theater featuring top entertainers. Also, outlet malls, flea markets, fine dining, country music theaters, Dixie Stampede and the Las Vegas based Legends Theater and over 100 world-class golf courses. 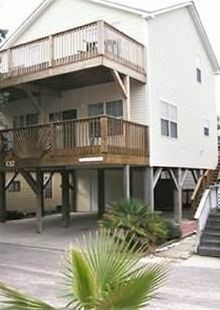 Our beach cottage is located close to the pool and recreation center. Linens are included for weekly stays during the peak season. Wi-Fi is provided for free at this house. WiFi available at the snackbar. TV's in living room and all bedrooms.